One of the advantages of being in Arizona for car guys is the chance to see new, unreleased “mules” on the road.Â Arizona is home to most of the car manufacturers for proving grounds.Â But these cars don’t just stay inside the fenced grounds, as these spy shots of the Nissan Rogue show.Â “Mules” are test cars used by the makers to test things out in real road conditions. They wander around the Arizona geography and get a chance to try out these prototypes on twisty roads, interstate highways and with elevations changing from sea level to high mountains.Â Of course the area is known for the opportunity to test in high heat conditions, but the cars get a chance to experience all of what Arizona climates offer.Â They often are loaded up with plenty of telemetries recording all sorts of feedback from a myriad of sensors. Of course the manufacturers aren’t keen on the public recognizing these cars.Â Besides sporting manufacturer plates these cars often have geometric black and white wraps to help disguise the final shape and design of the cars.Â But plenty of photographers go out on the hunt to track down a shot of these beauties. 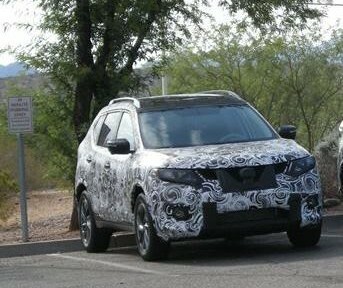 Recently two Nissan Rogues, which will have a new release in 2014 were seen out and about on the Arizona highways. It’s rare to see these cars stationary, but the drivers have to take a break on occasion!